Few things in life are black and white, and that extends to villainy; even Venom and their two-toned symbiotic suit stick out a long pink tongue, adding colour to the shades and humour to the horrible. With their eponymous film set to release via Sony Pictures (digitally on December 18 and on physical media January 8, 2019), we decided to explore that spectrum. Below you'll find five Spider-Man menaces who prove that being bad ain't a binary thing, ordered from least evil to most vile. Black Cat's first appearance, way back in 1979's The Amazing Spider-Man #194, came with the tagline, "Never let the Black Cat cross your path," a warning she'd drop as she pounced away. It was one Spider-Man didn't heed, as the hero got romantically entangled with her after a seductive, spur of the moment kiss. That this love blossomed even after she broke a criminal out of jail suggests that the web-slinger saw more in her than her penchant for petty crime. Perhaps that's because there was more to it. Her motivation for orchestrating a prison break was far from most supervillains in this universe, who typically want to put the escapee(s) to work on their own plot. Felicia Hardy simply wanted renowned cat burglar Walter Hardy to have the dignity of dying around family — her family. She'd eventually acquire powers beyond her feline-esque agility, adding the supernatural ability to ramp up bad luck, much like her namesake, thanks to Kingpin. She'd come to rival him as a crime boss, but would eventually give up the grudge and the life of (large scale) crime once again, something suggested by Venom, no less, who reminded her New York could always use more heroes. See? Not all bad. Pride is the most serious of the seven deadly sins, but since we're talking Spider-Man and not Daredevil, Catholicism doesn't come into play here. Instead of God-fearing, we have Gob-fearing, referring to the Goblins, Green and Hob, but neither of those villains are guilty of hubris. Our proud prowler is none other than Kraven the Hunter, whose prowess at pursuing prey eventually led him to boredom with big game and inspired a move from stalking the king of the jungle to Mary Jane Watson's "Tiger" in the concrete jungle of NYC. The new quarry was originally suggested way back in 1964's The Amazing Spider-Man #15 by Chameleon, who knew his old friend (later revealed to be his half-brother) would relish the challenge. Unfortunately, pride stops him time and time again from taking his desired throne as the world's greatest hunter, when he repeatedly underestimates Spider-Man. In the same year's annual of The Amazing Spider-Man, Kraven suggested the Sinister Six could definitely defeat the web-slinger together, because each member had gotten close alone, but just a few pages later he'd proudly refuse to hunt in a pack. With each of the Six taking a turn, Spider-Man bested the team of supervillains. The stubborn Sergei Kravinoff would eventually appear to slay his prey in the Kraven's Last Hunt story arc. Funnily enough, pride would push Kraven to don his fallen adversary's suit and hunt other villains in an attempt to prove further superiority. I guess this cardinal sin ain't always bad, but even if you think it's unforgiveable, at least that's pretty much the only one he commits and he keeps the collateral to a minimum, so even though Peter Parker (and the vegans) might disagree, Kravinoff's villainy is far from pure evil. Venom (the film) reframes the story of Venom (the character), and how could it not? With no webhead in the cinematic universe and, consequently, no Spider-Man spite shared by symbiote and host, the motivations of the latter, one Eddie Brock, had to morph. The film frames him more as a victim of his other's fusion fantasies than someone bent on vengeance against the perceived cause of their career's downfall. By the end they save the day and Brock lays down some laws for the symbiote, suggesting they can only kill criminals, even biting the head off one. It's a slippery slope, but the story of Venom is rife with examples of the character sliding down, only to rally on morality's better side. For example, a mere 75 issues after the character's introduction in The Amazing Spider-Man #300, they kidnap Peter Parker's recently reintroduced "parents" to get back at him. Despite that despicable act, Venom refuse to do harm to Richard and Mary Parker — even jumping through fire, one of the few things that can harm them, to protect the couple and refusing to tell them Spider-Man is their son, due to the mental anguish it could cause. Venom end the story by making a truce with Spider-Man after he saves Brock's ex-wife. It's far from their only truce, proving that even perpetual good guy Peter Parker can see the silver lining because even when Venom are evil they're good (and even when they're good they're evil). Such is the nature of a self-duelling dual being. Though better known for making Hell's Kitchen, well, hell for Daredevil, the crime lord was first introduced in 1967's The Amazing Spider-Man #50. Wilson Fisk, whose public-facing persona is that of a philanthropic businessman, came out of the shadows when Peter Park retired his alter ego and united the criminal underworld. This puppet master-esque control of all things illegal is the bulk of his bulky character, and that means he's got a lot of blood on his hands. His first story arc finds him threatening Daily Bugle publisher/editor-in-chief J. Jonah Jameson for his attempts at exposing NYC's crime renaissance. The stubborn journalist's refusal resulted in a kidnapping and murder attempt. That Fisk would go to these lengths for someone simply doing his job speaks to his ruthlessness. Yes, Fisk runs the streets below the rooftops where Spider-Man swings, but in the forthcoming computer-animated Spiderman: Into the Spider-Verse he sets his sights on other universes via a nuclear supercollider. The resulting portal brings together Spider-Men Miles Morales and, yes, Peter Parker, plus a few other web-slinging superheroes. Though Fisk will stop at nothing in his lust for power, there is one thread tying him to morality: love for his wife Vanessa, for whom he's even given up his empire. The Venom symbiote got a host who shared its hatred of Spider-Man, amplifying it in their union. The alien procreated and bonded with the nearest person, Eddie Brock's cellmate Cletus Kasady, amplifying the serial killer's psychopathic tendencies. Case in point? His first appearance as the fused being in 1992's The Amazing Spider-Man #360 found him picking his first victim in the phone book, settling on Gunther Stein because he thought the name was "REALLY stupid." The random nature of that selection exemplifies Carnage's nihilist philosophy. He believes laws are unnatural and the world is inherently chaotic, yearning for an existence akin to the anything-goes world of The Purge, but it's extended beyond 12 measly hours. He recruits more disciples to his worldview in the 1993 Maximum Carnage arc (and resultant, notoriously difficult videogame adaptation), during which a group of super villains go on an absolute massacre. There's not a good bone in Kasady's body and evil literally runs through his veins, as the symbiote bonded with his blood through an open wound. Speaking of blood, he leaves "Carnage Rules!" at his crime scenes in sanguinary scrawl, using either his victim's or his own. 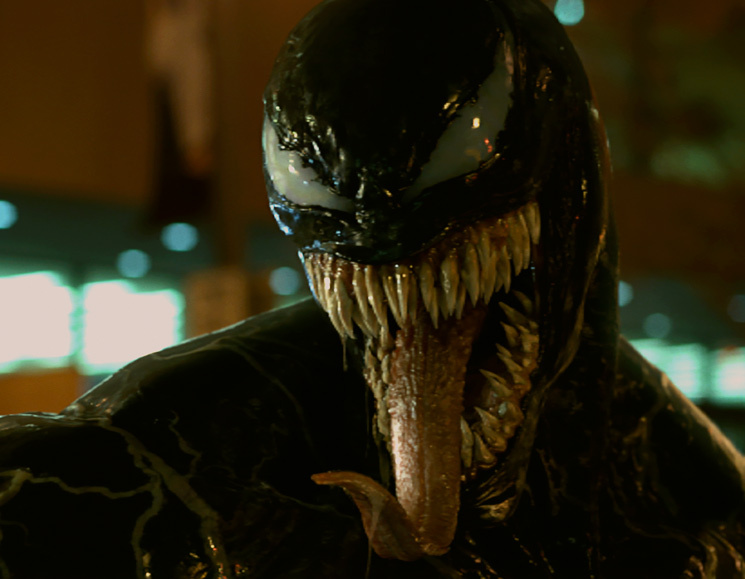 The trope appears in a mid-credits scene in Venom, during which Kasady had used the substance to write a greeting to Brock when the journalist visits him in prison for an interview. It's an obvious sequel setup, and we can only hope they do the seriously sinister character justice with the only rating that will suffice: R.